Teen Wolf meets True Blood in this fun, boy-friendly story. Being only half-vamp in a high school like Carpathia Night makes you a whole loser. But Danny Gray manages to escape the worst of the specists at his school. Thanks to the genetic treatments he had as an infant, most people assume Danny's other half is human. Which is a good thing. Ever since the development of synthetic blood - SynHeme - vamps have become society’s elite, while wulves like his father work menial jobs and live in bad neighborhoods. Wulves are less than second class citizens; once a month they become inmates, forced to undergo their Change in dangerous government compounds. For Danny, living with his vamp mother and going to a school with a nearly all-vamp student body, it’s best to pretend his wulf half doesn’t even exist. But lately Danny's been having some weird symptoms — fantastic night vision; a keener-than-usual sense of smell; and headaches, right around the full moon. Even though it's tempting to live in denial, it's hard to ignore evidence. There's only a month until the next full moon, and Danny's time is running out. Peter Moore speaks to adolescents in a voice that will have them laughing, set in a world that will get them thinking. Okay, so I have to admit that I've never seen Teen Wolf or True Blood so them meeting has no significant impact on my review. I do think however, that this book is very boy-friendly. 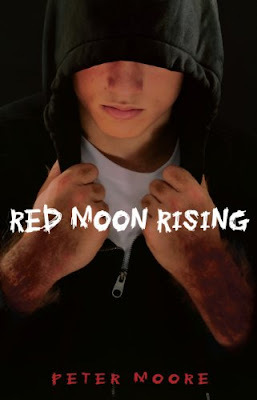 So ladies if you are trying to get your boyfriend to like a good dose of blood-sucking vampires and hairy werewolves in their literature, then I recommend Red Moon Rising. Danny is hilarious in his alternate vampire/human/werewulf universe! He can crack a joke faster than I can read it! But his dilemma just didn't stick with me. I couldn't sympathize with him. Why? You ask. Well, it's because in the beginning of the book he himself is a specists and I felt that he deserved what he turned into because of his unwillingness to accept that his father was a wulf. And that brings me to his family. They were awful!!! They made me want to strangle each and every one of them! Their own father/husband was a wulf yet they hated the species just because of their genes. I don't understand how people can be so evil to other people. The main force driving this novel however is the plot. It's slow at times and extremely fast at others. I liked it. The beginning wasn't a bunch of rubble that I had to make myself get through just so that I could figure out the ending. If there isn't another book after Red Moon Rising I will be severly ticked because the wulves and their Civil Rights movement deserve a happy ending. *I received this book for review from the book tour Different Area Codes Book Tour this in no way affected my opinion.